A big buyout shows one of the keys to surviving in retail. We're entering a strange time for retailers. Online companies like Amazon.com (NASDAQ:AMZN) continue to steal share with lower cost structures and lower margins. Legacy retailers are going to have to find ways to compete. Here are three things I think need to happen for them to stay ahead. Don't be shocked if the OfficeMax-Office Depot merger isn't the last we hear of retail buyouts this year. There are a number of retailers struggling to find their way in the changing world of commerce. I'm not sure bringing two struggling office chains together is the solution, but having fewer stores for the space isn't a bad thing. Consolidation is one way to eliminate supply from the system, especially when demand is down. The consolidation trend will likely continue, and there are plenty of targets for chains to add. If a retailer doesn't sell essential items (milk, produce, toilet paper) that Amazon can't poach by simply lowering its price, they're probably in trouble. 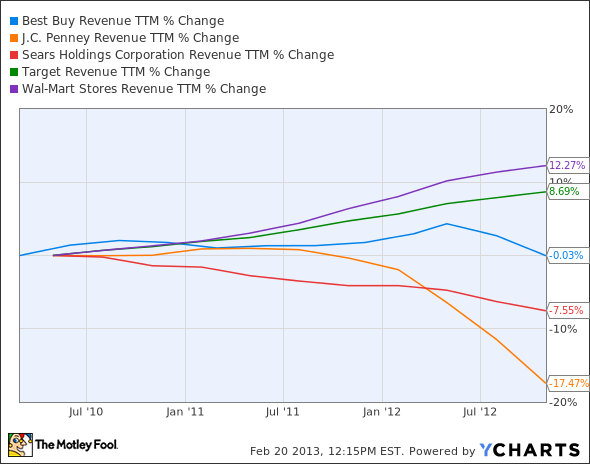 Look at the sales of J.C. Penney, Sears, and Best Buy over the past three years. Despite a growing economy overall, they've seen sales decline. BBY Revenue TTM data by YCharts. That contrasts with Target (NYSE:TGT) and Wal-Mart (NYSE:WMT), which have been able to grow because they're a more essential stop on the errand run. Struggling retailers need to merge and consolidate the industry to hope to survive against online retailers and discount stores that sell everything. The shopping experience has changed, and retail needs to change with it. More and more we're seeing branded stores that act not only as retail shops but also as showrooms for products. Apple started the trend and now can boast being the 21st largest retailer in the U.S., according to Stores magazine. It did so by creating a place where you can touch and play with devices before buying them. Nike has expanded retail stores to get in front of customers who may be buying clothing online instead of at traditional outlets. This change in strategy will work for some brand retailers, but many need to innovate further. Amazon may be taking more share in everything from electronics to clothing, but there are still essential items Amazon will never sell in bulk. I doubt you'll be buying milk online or having toilet paper delivered by UPS. These essentials still belong to grocery stores and discount retailers. Target and Wal-Mart will be able to leverage this advantage, but they need to innovate even further to survive in the future. There's no reason I shouldn't be able to order everything I need online and pick it up at my convenience at the store. Here's an idea for Target to build an online presence while keeping stores busy: I'll build a shopping list on my phone (as many of you do too) and when I'm ready to head out, I'll tell Target I'm coming. Maybe I'll wander the aisles for a few items I need or maybe I'll choose to have my items placed straight into my trunk and pay online. Imagine the ease that would bring to shopping if I could get items today and never leave the comfort of my car. To leverage that idea, I think location will become increasingly important to everyone in retail. Why should I drive 10 miles out of the way to buy something Amazon will deliver to my door in two days? Even Target or Wal-Mart will need to be on the way for me to stop by to pick up items, even if they do put them straight into my car. Location has always been key to retail, but it will only become more important in the future. The convenience of shopping online has negated the need to go out of our way to shop for everything from socks to rare electronic gadgets. If it's not convenient, we aren't going to buy it. Retail is changing, and retailers need to change along with it -- particularly those who have been struggling. I think we're in for more consolidation, some surprising innovations, and a renewed focus on location from those who survive.